With no onward chain this lovely light bright two double bedroom first floor apartment is ideal as a full time home or maybe a lock up and leave. The location of this apartment in Roundham is superb with easy access to Goodrington Beach and Paignton Town Centre. There are some lovely open views enjoyed to from the living room, kitchen and both bedrooms. Secure entry system into a pleasant communal hallway with stairs turning to the first floor. 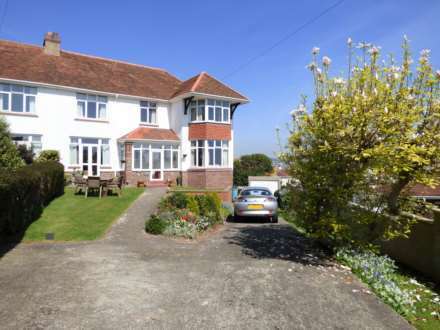 Off the hallway of the flat are two double bedrooms one with ensuite shower room, a bathroom, modern fitted kitchen and bay fronted living room with lovely open aspect across Goodrington, Clennon and along the coast towards Broadsands. Double glazed throughout and heated by gas fired central heating. The communal gardens are lovingly cared for. There is allocated parking plus visitor parking. Radiator. Fuse Box. Secure entry system. Access into roof space. Inner hallway with a further radiator and cupboard which houses the gas fired central heating boiler. Lovely light room with double glazed sash bay windows to the front overlooking the communal gardens with Goodrington, Clennon Valley and surrounding areas plus sea view towards Elberry all being enjoyed. TV aerial and telephone points. Radiator. Modern well fitted kitchen to two walls. The kitchen comprises of wood effect matching wall and base units set beneath a square edge slate effect work surface with tiled splash backs. The base units incorporate drawer and cupboard space with inset 1 1/2 bowl stainless steel sink unit with built in dishwasher and washing machine. There is also a built in fridge freezer, inset gas hob with extractor hood over and oven beneath. The wall mounted units have some under lighting. Radiator. Again some interesting open views are enjoyed across St Michael`s with Primley Woods in the distance. Modern suite comprising a low level WC with matching pedestal wash hand basin with mirror and light over. Step in shower cubicle with thermostatically controlled shower and splash backs. Tiled walls. Extractor fan. This room again enjoys an open aspect to the front looking across the communal gardens, Goodrington, Clennon Valley and the surrounding areas. Radiator. TV aerial point. Modern white coloured suite comprising of a panelled bath with shower screen and attachment. Low level WC and pedestal wash hand basin with mirror and light over. Part tiled walls. Radiator. Down lighting and extractor fan. There are use of the communal gardens to the front which are mainly laid to lawn with flower beds and borders. There is an ALLOCATED PARKING SPACE plus there is visitor parking available. This information will require to be verified by your solicitor. The property we understand has a 99 year lease starting in 2007 (therefore 88 years remaining). The development is managed by Redsands Management Company with the charges currently around £1,200 per annum. These charges include maintenance of communal areas including the gardens, buildings insurance, fire alarm and emergency lighting, sinking fund and managing agents fees. Long term and holiday letting is possible. Pets are also considered.